Come and celebrate the 25th Skills Canada National Competition in Halifax, Nova Scotia, May 28 and 29! The Skills Canada National Competition (SCNC) is the only national, multi-trade and technology competition for students and apprentices in the country. Each year, more than 550 competitors from all regions of Canada come to SCNC to participate in over 40 skilled trade and technology competitions. By providing a forum where Canadians can compete at the national level, SCNC provides hands-on work experience related to skilled trade and technology careers. 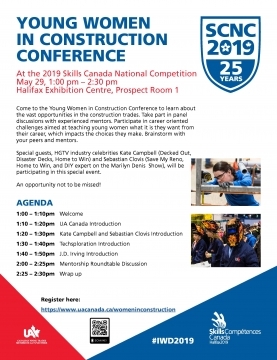 Save the date for the 26th Skills Canada National Competition! With its location near the mouth of the Fraser River and on the waterways of the Strait of Georgia, Howe Sound, Burrard Inlet, and their tributaries, Vancouver has, for thousands of years, been a place of meeting, trade and settlement. It is consistently named as one of the top five worldwide cities for livability and quality of life. Winters in Greater Vancouver are the fourth mildest of Canadian cities after nearby Victoria, Nanaimo and Duncan, all on Vancouver Island. Through SCNC, Skills/Compétences Canada promotes skilled trade and technology careers to Canadian youth. The Skills Canada National Competition is our flagship event and is an ideal way to connect with students and apprentices!